Walvis Bay — Government's commitment and effort to attract foreign direct investment was reaffirmed yesterday when President Hage Geingob took the first locally assembled Peugeot 5008 on a test drive. Officially inaugurating the assembly plant yesterday, Geingob said the feat signals Namibia's ambition to become one of the premier destinations for foreign direct investment in Africa. "We failed in the past but I don't know how we succeeded this time around. It was not easy to meet the conditions but our hard work has finally paid off," an ecstatic Geingob said, to thunders of applause. President Geingob added that government's objective since independence was to create conditions necessary for increased investment and developing of a competitive industrial sector. "We have intensified efforts to promote local value addition and strengthening of forward and backward linkages within the Namibian economy. Hence the assembly plant is not only significant for the Erongo Region and Walvis Bay but for the rest of Namibia as it further amplified the country's national development aspirations... " Geingob explained. Namibians should be mindful of the fact that government's efforts to attract foreign direct investment to Namibia's shores are not merely for the purpose of establishing factories, but these investments should buttress efforts to boost local enterprise development and increase the entry and participation of emerging and existing businesses into the mainstream economy, he urged. This, he said, are the lingering legacies of the country's past, which was characterised by the politics of structural economic exclusion, among others. "Sustained and shared economic development is viewed as [a] measure to redress imbalances of the past and eradicating these scourges from the fabric of our society," he told the gathering at the west coast harbour town. 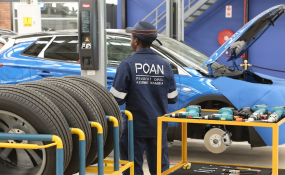 "Hence, it is our hope that the Peugeot Opel Assembly Namibia Plant will be a project that will bolster the diversification strategy set out in our growth at home strategy." "We expect our local small and medium enterprises to incur benefit from this investment, further enabling Namibia to realise the positive externalities and spill-overs [of] this investment," he said.